Across much of the United States, producers are gearing up for or just finished their first hay cutting. As easy as it is to get swept up in the hustle of the season, pay close attention to cutting height for the first and future cuttings. While maximum yield is sometimes the goal, a short cutting height can lead to several issues farther down the road. “I’ve seen many fields that have been ‘scalped’ right to ground level by disk-type mowers,” says Dwane Miller, Penn State Extension agronomy educator. “This differs considerably from the older sickle bar mowers, with a technology requiring a higher stubble height,” he adds in an article from the Penn State Extension Field Crop News. The longevity of forage stands can be severely weakened if cut too low. It is generally known that alfalfa can tolerate a lower cutting height. However, to better understand this concept, you need to think about where the energy is stored in the plant. 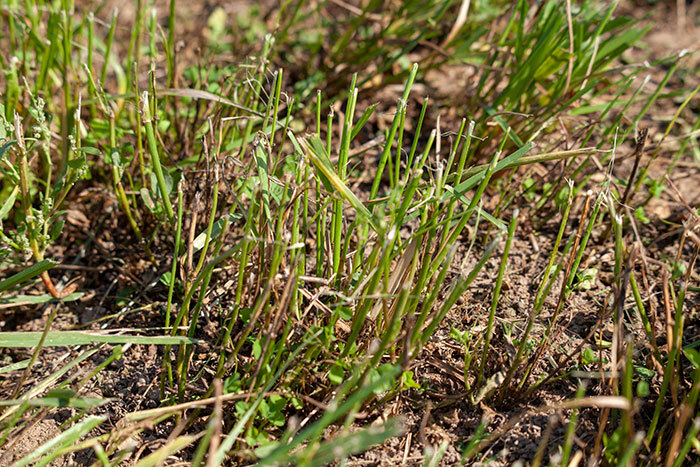 Alfalfa stores energy below ground in its taproot, while grasses store their energy above ground in the stem base and tillers. Frequently cutting grasses at a low height diminishes the stored energy, which results in shorter stand longevity. Another negative effect of low cutting height that deserves consideration is a higher forage ash content. Forages have a natural ash content of around 6 percent, according to Miller. An additional 10 to 12 percentage points can be added if forage is cut too low and more soil gets incorporated into the crop. Field unevenness and rodent holes can contribute to the ash content of your harvested forage. So, how low is too low? “The first question I always ask is: ‘Is it a solid stand or a mixed stand?’ If grasses are involved, you must keep cutting height higher than a pure stand of legume,” says Miller. He recommends the following minimum heights for cutting, recognizing that it is often more practical to cut a bit higher. Keep a 2-inch minimum. Frequent cuttings at early maturity will dissipate carbohydrate reserves. This could be offset by allowing one cutting of alfalfa to reach the bloom stage each year. Follow a 4-inch minimum in the establishment year and a 3-inch minimum in the following production years. The production years are when most of the stand longevity complications can be observed, especially if stands are cut frequently. Manage for the predominant species. If the stand is mostly alfalfa with some grass, use a 2.5-inch minimum. If it is grass with some alfalfa, use a 3-inch minimum.